Yesterday, I had a good laugh about it, but all kidding aside the closure of the Caracas-La Guaira highway has staggering implications. The more I think about it, the more I realize what a mess this is. And it’s not just a problem for Caracas and La Guaira, but for the whole country. As you can see in this Google Maps image, Caracas is built on a high valley, set off from the sea by a string of mountains. 1-There’s no easy way to get in or out of Carcas by air. 2-There’s no easy way to supply Caracas by sea. 3-The hundreds of thousands of people who live by the seaside and work in Caracas can’t get to and from work. There are two alternate routes to get from Caracas to La Guaira, the main seaside town. The first is the “old road” – a two-lane road that follows along the tracks the Spanish built in the sixteenth century, basically a glorified donkey-cart path. Without traffic, it takes about two and a half or three hours to go from Caracas to La Guaira on the old road – but, obviously, if you re-route all the highway traffic, the old road will turn into one gigantic, neverending traffic jam. Worse still, the old road is fringed by some of Caracas’s most violent slums for most of the way, and is known as one of the most dangerous in the country. Being stuck in traffic for hours on end on the old road is a truly scary prospect. 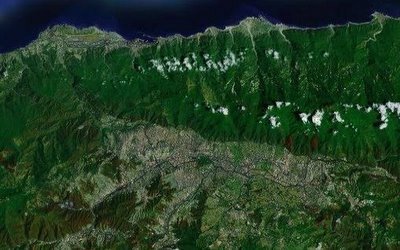 The only alternative would be the Carayaca road, which serves a hill-top village between Caracas and La Guaira and takes about four hours to transit at the best of times. I’ve never been on it, but I understand the Carayaca road peters out into a dirt track for most of the way. I doubt it’s suitable for heavy trucking. In terms of air travel, I suppose people will have to start using the Los Caracas airport (which is a small, private airport on the south side of Caracas that was never meant to be used by large jets) or the Valencia airport – which, at 3 hours away by road, is now closer to Caracas than Maiquetia (!) Diosdado Cabello was even talking about rerouting air traffic to Higuerote and Ocumare del Tuy – come on, those aren’t even airports, they’re more like landing strips! All the options are bad, but I suppose something can be worked out. For sure the hassle quotient will be high, and airlines will take a big hit. In terms of shipping, I suppose the port of Puerto Cabello will have to take most of the load – but again, it’s neither big enough or close enough to really substitute La Guaira. And you have to bear in mind that La Guaira port served not just Caracas, but much of the country. With the highway closed, the port is next to useless, and the consequences will be felt far beyond Caracas.